Welcome to the Delta Strummers, an amateur group of ukulele players based in and around Brentwood and Discovery Bay, California. We are the East County’s leading ukulele band. We frequently play for senior residences, assisted-living homes, elementary schools, and clubs in the area, in addition to our public concerts. Under the leadership of Music Director, Ernie Macintyre, the group has grown to around 60 members, adding depth and breadth to our music and singing. We welcome newcomers to the group, so consider playing the ukulele and joining the Delta Strummers. Photos from our various performances can be viewed by clicking the Photo Gallery link in the menu above. Videos of a number of performances can be viewed by clicking the Videos link in the menu above. The Band is currently practicing for our June concert at El Campanil Theatre. The practice list includes a significant number of new songs, in addition to several old favorites. Click the Calendar tab in the menu above for dates and locations of upcoming performances. In 2019 the Delta Strummers initiated a ukulele scholarship program with a local elementary school. Approximately 60 3rd and 4th grade students are being taught to play the ukulele while accompanying themselves singing. 12 Delta Strummers volunteers help tutor the students at weekly classes. Students graduating from the class will perform at a concert for the entire school, and a separate concert for parents. The Discovery Bay Press recently published a complimentary article on the Delta Strummers. See here. Our performances feature several ‘breakout groups’, or small groups of musicians/singers performing one or more songs. These groups include ‘The Garage Band’, ‘No Strings Attached’, ‘The Office’, ‘The Ah Capellas’, ‘The Bridge Kidz’, and ‘The Band In The Bay’. Several band members are also featured in solo renditions of some songs (playing &/or singing), with the backing of the band. Another featured breakout group, ‘The Banjoukers’, is a subset of the band playing banjo ukuleles (banjoukes) on appropriate numbers. Our weekly group practices are held on Tuesday evenings at Summerset IV in Brentwood. We offer beginning ukulele lessons, led by our Music Director, assisted by a few of our experienced players. Classes are well attended, and participants are able to transition to our main playing group as they achieve some basic skills. If you wish to learn to play the ukulele, or merely wish to enhance your playing skills, click the Contact Us link in the menu above. To download the latest edition of the Delta Strummers newsletter, visit the Newsletter link in the menu above. 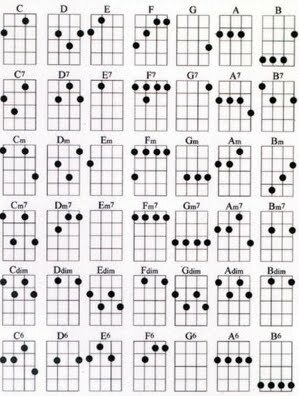 Roll your cursor over the menu under the image at the top of the page and explore the links to numerous ukulele-related pages.